For a 2 star roadside Motel the Days Inn Graceland in Memphis was clean, comfortable, quiet (at night) and guests could relax by the guitar shaped pool whittling away the hours before darkness. 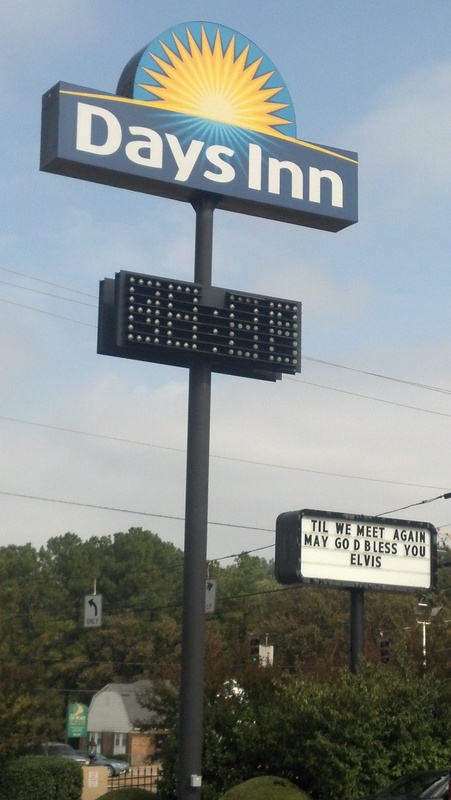 Bedecked in Elvis memorabilia with speakers repeatedly playing The King’s greatest hits throughout the day, the Motel boasts prime location for those wishing to visit the home of the late rock ‘n’ roll star. The continental breakfast was poor [We’d never seen butter in a squeezy sauce bottle before] but we ate what we could before checking out at eleven o’clock. It was now we discovered our rideshare had let us down with a lame excuse and wouldn’t be making the trip to New Orleans after all. We were now left with no transport and the possibility of staying another night in Memphis. A quick dash to the airport via Uber proved fruitless as every car from every company was booked due to the start of the Fall holiday, plus a big sporting event. Eventually after a bit of a panic, we found one from Enterprise Car Hire and another taxi ride across town from the airport to collect it. We were now on our way over an hour later than our planned departure time but relieved to be on the road and heading for New Orleans. Almost four hundred miles and six hours on Interstate roads can be monotonous so we stopped a couple of times to refuel and grab a bite to eat. Our second stop, just south of Jackson, Mississippi saw us narrowly escape being caught up in a gang fight when a group of about two dozen young men in cars drove into the parking lot before setting about each other. Luckily we were reversing out and left the drive-thru without damage to the car or ourselves. By the time we arrived in New Orleans it was dark but still early enough for us to drop off the bags at the apartment and walk to a nearby restaurant for dinner. We stayed in two apartments during our time in “NOLA”. Both located in excellent neighbourhoods within the Garden District. Firstly on Camp Street close to Audubon Park and the City Zoo, where we stayed for a week. Camp is just one block from Magazine which boasts an array of shops, restaurants, bars and health and fitness studios. Every bar and restaurant here and many shops were dog friendly and the relaxed lifestyle was to our liking; so much so that we decided to remain in New Orleans for another month instead of splitting our time with Houston, Texas where we’d eventually end this stage of our American adventure. 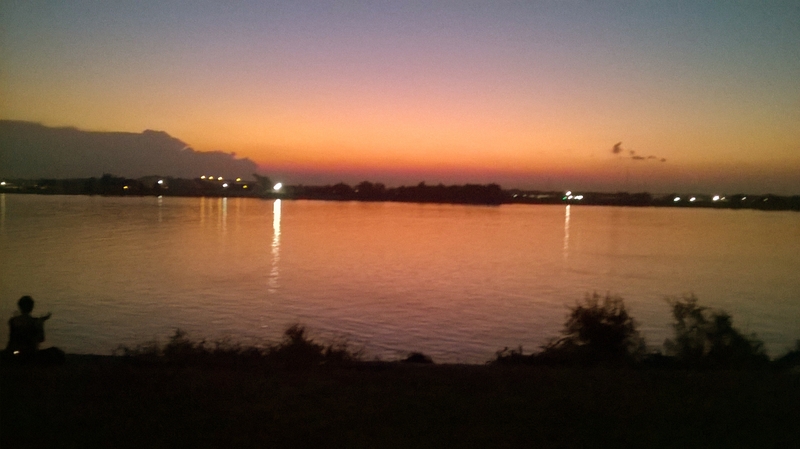 This part of town also seemed to be one of the best locations to watch the Southern sun sink below the horizon across the Mississippi river producing a blood red sky in the process. A wonderful natural phenomenon attracting locals and visitors alike on a nightly basis. Our second apartment we rented from a letting agency for one month, this time in the Lower Garden District and only two blocks from Magazine. Closer to downtown and the French Quarter it looked onto Coliseum Park. This was a fabulous place for Hamish to run free with other dogs, chasing the many squirrels. Again close to shops, restaurants and bars, including our favourite “Seed” famed for its vegan and vegetarian cuisine and a fabulous bar called “Barrel Proof” specialising in whisky. 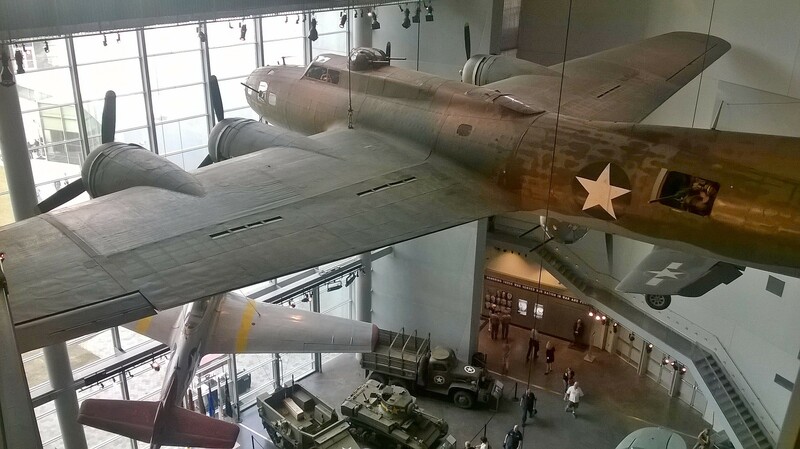 The National WWII Museum voted No1 attraction on TripAdvisor for New Orleans is a must see and was only a stones throw away. It gives, at times, a harrowing account of the brutality and senselessness of war and cost to human life but is also a fitting and dedicated tribute to all those who enlisted, many never to return. 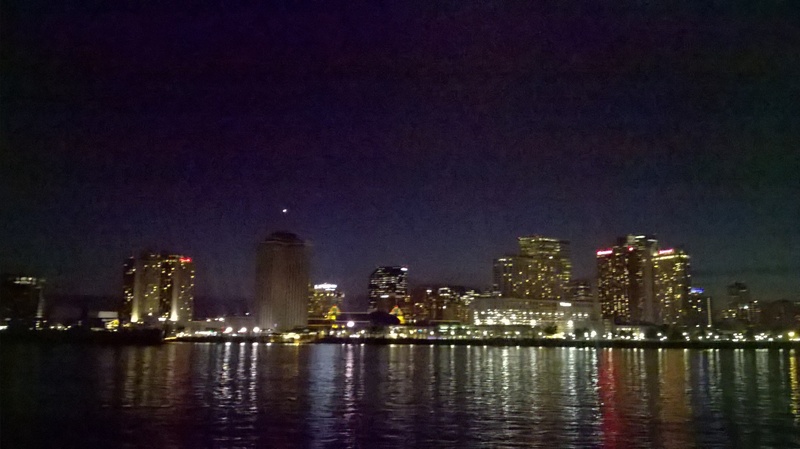 Compared to the UK’s muted celebrations, the US see Hallowe’en as a big event and nowhere more so than “The Big Easy”. Homes and businesses, small and large, beautifully adorned with ghosts ‘n’ ghouls, skeletons and every ghastly guise you could imagine. 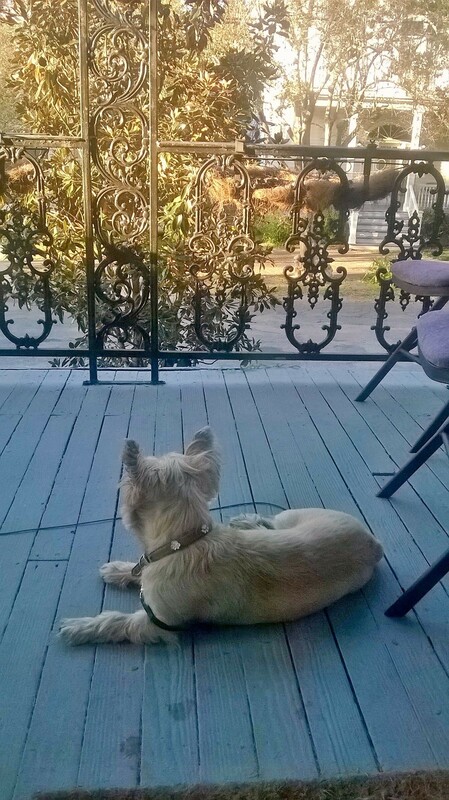 We attended a Hallowe’en puppy party with Hamish; the following night lined the streets to watch the Krewe of Boo Mardi Gras style parade. During our stay we were advised to visit a cemetery. 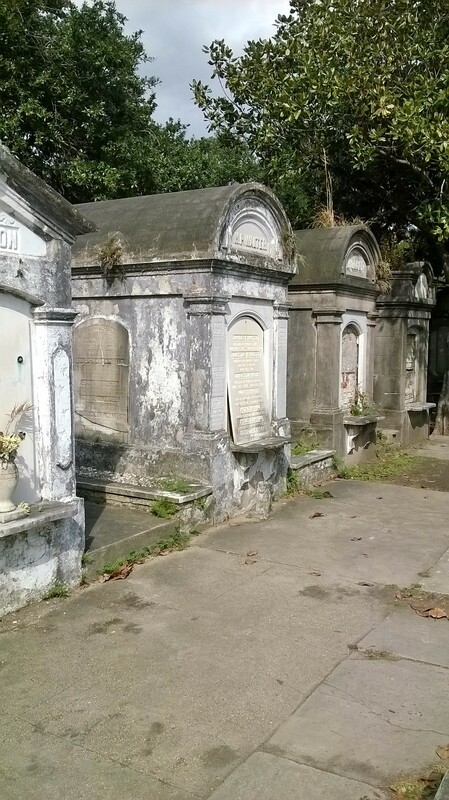 As New Orleans is mostly below sea level, many of the dead are not buried six feet under but enclosed tombs above ground. This is due to the high water table which often saw coffins reappear after periods of heavy rain. Weighing down with rocks or boring holes for “drainage” also proved, at times, unsuccessful thus the introduction of this method of internment which became known as Cities of the Dead due to the street-like similarities. 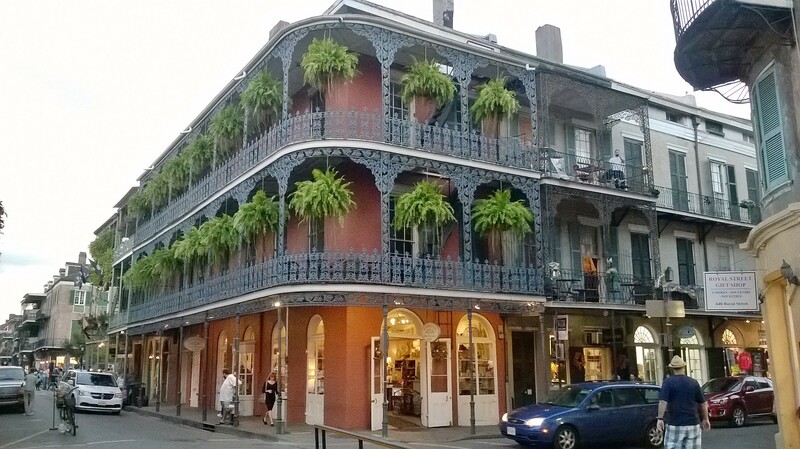 Of course no visit to New Orleans is complete without a visit to the French Quarter. With its fabulous old world colonial architecture, the streets are lined with unique shops, bars, restaurants, musicians, artists and street performers, all vying for a slice of your tourist dollar. 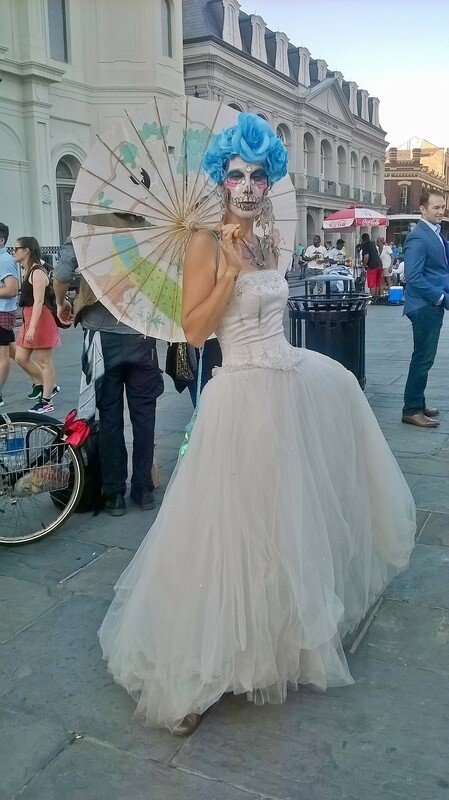 For nights out, the locals seem to prefer Frenchmen Street, excellent for live music whilst weekend revellers head for Bourbon Street and the many bars and clubs. 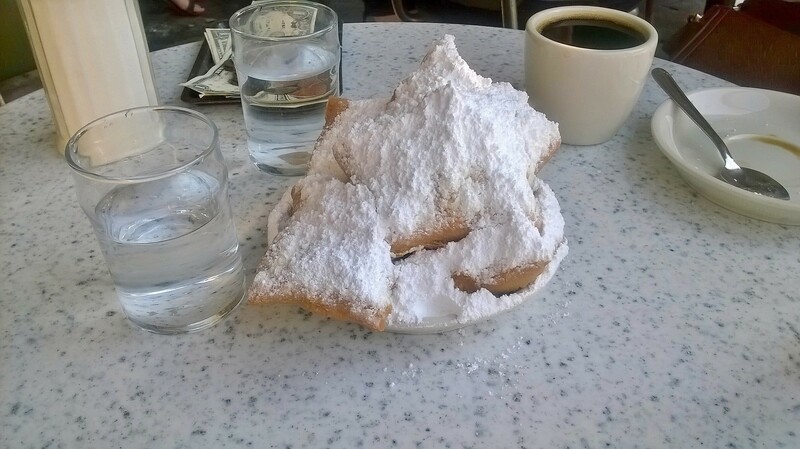 During one of our frequent visits we chose to lunch at the famous Café du Monde sampling their French delicacy of Beignets, or French fritter. The only food on their menu, a beignet is a square piece of dough, fried in vegetable oil and lavishly covered with powdered sugar. Open 24 hours a day, locals and visitors alike flock to the Café often queuing to get in. Other times we were happy to sample the street food at the farmers market, and though cheap and cheerful the quality was excellent and well worth a return. 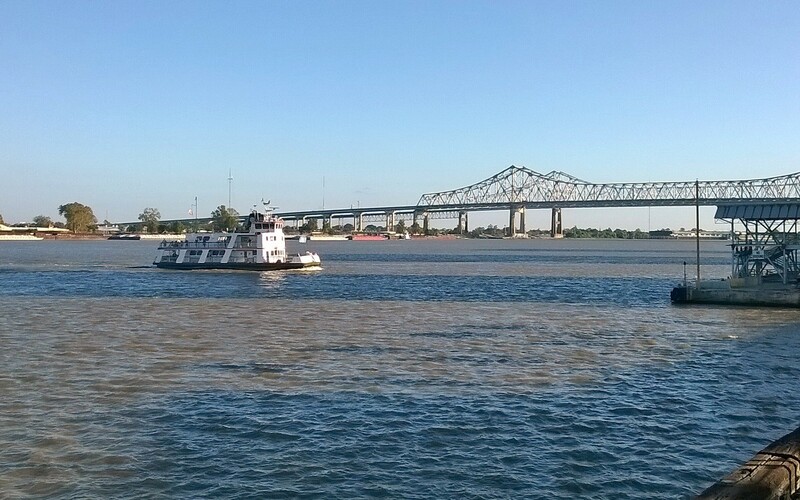 On the edge of the Quarter sees the Mississippi river. From here you can book a trip on one of the river cruises. 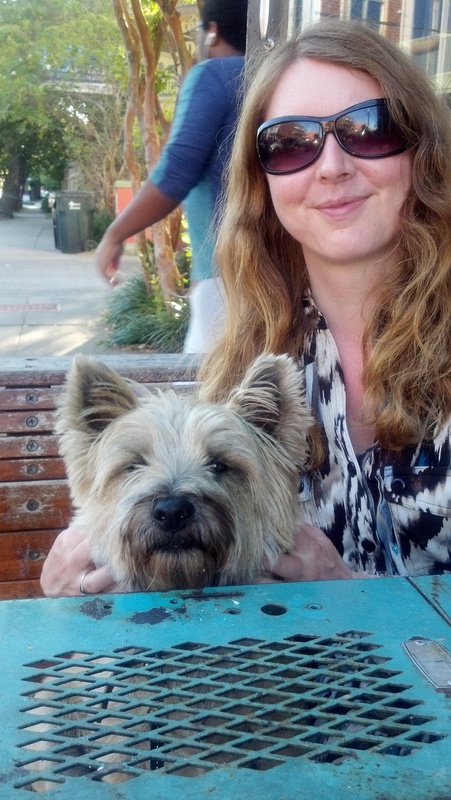 We chose the cheap option of the Canal Street-Algiers Point ferry ride costing two dollars, Hamish was free. The ferry took you across to Algiers where a picturesque village awaits. Beautiful homes, a couple of good cafés/bars and a great off the leash walk for Hamish to enjoy along the river bank on the built up flood levee, enjoying great views of the city skyline. The last ferry leaves Algiers at 21:30hrs giving you plenty of time to explore and make the return journey to the city centre. If parks are your thing, New Orleans has several to choose from, including The City Park, Audubon Park and The Louis Armstrong Park; all sizeable and take you out of the city bustle. Just remember to take your mosquito repellent. 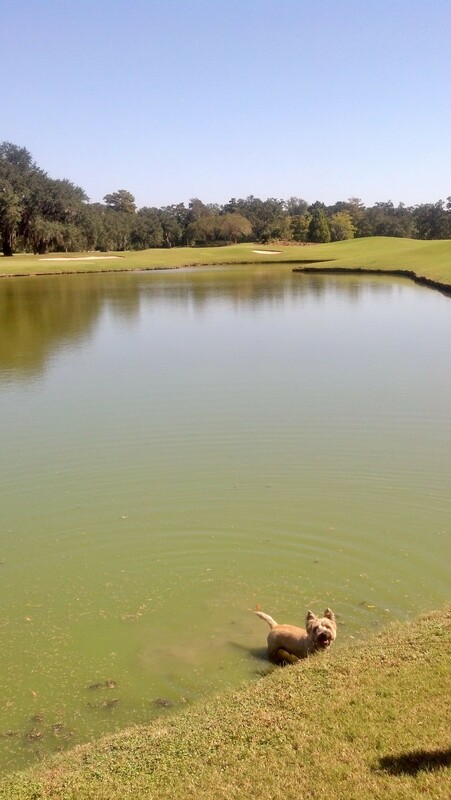 In City Park you can also apply for a permit to allow your dog off the leash. We did this for Hamish and was well worth the $10 for a one week permit to see him run free. 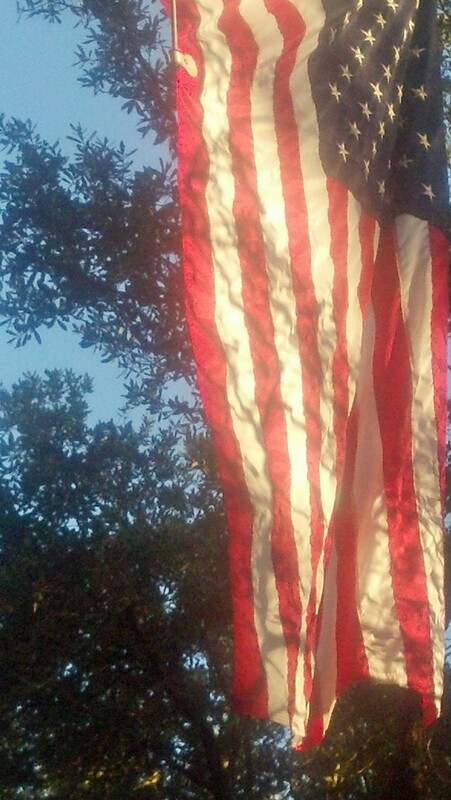 Audubon Park has a great running and cycling track and we took the bikes out [once]. So an excellent end to our US trip. 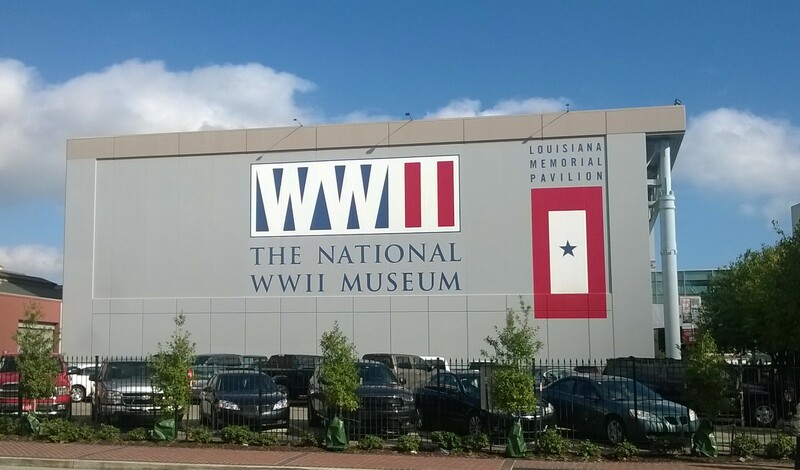 New Orleans, a vibrant European style city in the southern state of Louisiana, has something for everyone; we could’ve stayed even longer than the five weeks we did. From the food and drink to the laid back Southern hospitality, the city made us feel at home thousands of miles away from our own and had us promising a return. And should we return, there’s still plenty to do and see, including – Swamp and Voodoo tours, beaches, sporting events, house tours of the many movies filmed on location and of course even more restaurants with fine fare to sample. All that is left is a long drive to Houston Tx where we depart for Mexico City and the next stage of our adventure.